Barefoot with Champagne: First Anniversary in Sunny Florida! First Anniversary in Sunny Florida! We had an amazing trip for our first anniversary! It was a month or so after thanks to Dental school but it worked out perfectly! Dave's awesome Mom let us borrow her sweet ride to take on our 15 hour road trip! We had a few minor speed bumps regarding with XM radio station we could stick with but besides that the ride was brilliantly smooth! Thanks Opal! We enjoyed being walking distance to The Back Porch. It was nice being able to enjoy a daily Back Porch Punch or Frozen Vodka Pink Lemonade while basking in the sun! We made a Wal-Mart trip so we had some snacks at the condo and I'm super jealous that you can buy wine and champagne at WalMart's everywhere else! Loved laying out at the beach, there was no oil or tar balls anywhere! And there were hardly any people there. (Probably due to the oil spill scare) But we enjoyed having our pick of chairs and plenty of room to play in the rough waters! Finished The Nanny Returns sitting in that chair! It was good, took a while to get going, I was bored at first and couldn't quite remember everyone from the first Nanny Diaries book. But once it picked up speed I loved it! We hunted for crabs on the beach at night, caught a few, lost a few... but had fun nonetheless! Dave scared me by showing me how many tiny crabs were actually running around... it looked like a horror movie preview. We enjoyed downtime on our balcony with some tunes and some scrabble! Nightly glass of vino on the balcony! 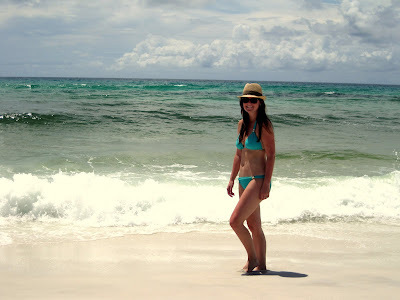 I got the courage to wear my new beach hat! But I did score the J.Crew Pixie Pants for half price! In the shade - saving our skin from wrinkles! Mom would be proud! Surprise fireworks Dave planned they do every Thursday at some Casino down the bay. Thanks for planning the best anniversary day I've ever heard of, you're the best! On the walk to dinner, Lindy was inspired and wanted to have a photo shoot for us! Not a bad spot to wait for a table, toes in the sand and drink in your hand! Our table was ready and this happened... haha! We ended the night with a long walk down the beach hunting for crabs maliciously slamming the net into the ground at crabs. We may have had one too many Back Porch punches b/c we didn't catch very many crabs and we were definitely stumbling but that's probably because walking in the sand is hard! Dinner at RedBar wasn't just dinner, it was an experience of a lifetime! Seriously, some of the best live music with some of our best friends eating and drinking some of the best food! It was definitely a night for the books! Dave ordered after dinner coffee and we all made fun of him. I hope you enjoyed the highlights of our trip! If you have any questions, please feel free to contact me, or Comment! Peace my friends! You two are just fun people! I love reading your blog, Christine! 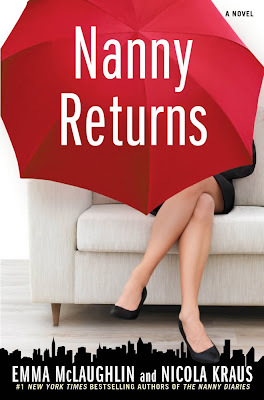 I have been wanting to read The Nanny Returns. You look great in the hat! Did you stay at the Destin Gulf Gate? 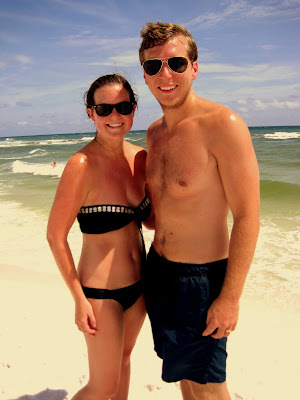 I got married in Santa Rosa Beach, but we stayed there before the wedding. :) Looks like a great trip! I wish this was my to-do list! Today's Gonna Be A Greeeeeaaaat Daaaaay! "Take 2 weeks off then quit"